Just having a little fun with apples and circle-dots. If my son would just stop sneaking into my studio and eating all my apples! HAahaha that's again so funny! You should do a portrait of your son. Very ince colors - I love the red! You are very talented, Carol! 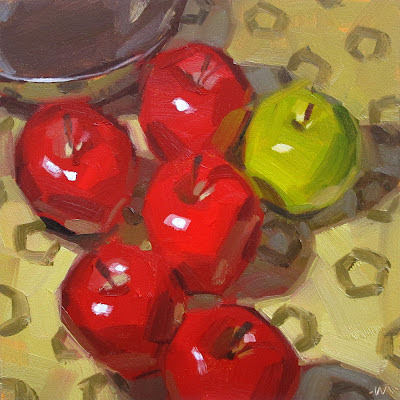 An apple a day keeps the paintings away? carol me tienes ..pillao... con tu pintura saludos. At least he is eating something good for him. If you were painting chocolate I would sneak in for that, lol. Love the printed fabrics and your apples are always perfect. Kids eat everything you don't want them too and nothing you do want them too! Just wait till he gets bigger.....nuf said. Maybe he'd like to paint some fabrics for you? just a thought;) I love your original backgrounds- unique!